Can You Eat Cabbage When You're Pregnant? During pregnancy, you need to avoid certain foods and eat more of other types of foods to ensure both you and the baby get the nutrients you need. Vegetables are generally one of the foods that you should eat plenty of when you are pregnant, and cabbage is no exception. Cooked cabbage is safer during pregnancy than raw, however, since cooking limits the risk of food-borne illness. According to the American Pregnancy Association, a cup of cabbage counts as one of the recommended servings in a pregnancy diet for calcium-containing foods, which help your baby form strong bones; for iron-containing foods, which help keep you from developing anemia during pregnancy; and for folate-containing foods, which help limit the risk of neural tube birth defects. Each cup of cooked cabbage has about 2.8 grams of fiber, or 12 percent of the daily value. Fiber can help limit your risk for constipation, which some pregnant women are prone to develop. 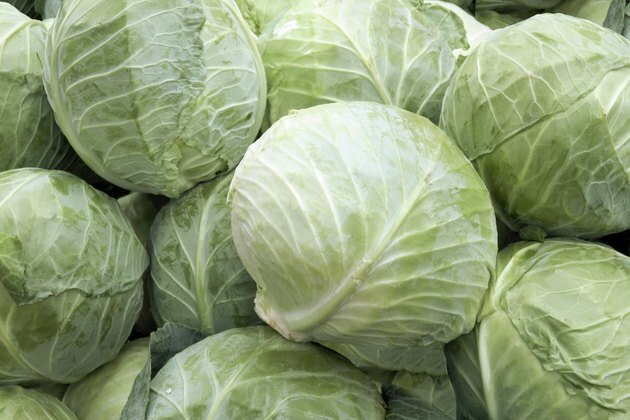 Cabbage is also an excellent source of vitamins C and K.
Women only need about 300 extra calories per day during their second and third trimesters, but it can be easy to eat more than this and gain extra weight. Green leafy vegetables, such as cabbage, are low in energy density, meaning that you can eat a lot of them without eating very many calories. They also provide large amounts of essential nutrients, so they can help a pregnant women meet her increased nutrient needs without gaining too much weight. Gaining too much weight during pregnancy puts you at greater risk for premature birth, having a cesarean delivery and being overweight after your pregnancy, according to BabyCenter.com. You may want to stick with cooked cabbage instead of raw during your pregnancy. Raw vegetables are more likely to be contaminated by bacteria that can cause food-borne illnesses, such as listeria. Getting listeria during pregnancy can cause premature delivery, miscarriage or the death of your baby, and pregnant women are more likely to suffer from listeria after eating contaminated food than nonpregnant women, according to the American Pregnancy Association. At each meal, fill half of your plate with fruits and vegetables, recommends Drugs.com, which also advises you to include more dark green, red and orange vegetables in your pregnancy diet. The more darkly colored a fruit or vegetable, the more nutrients it usually contains, including beneficial plant chemicals that act as antioxidants or provide other health benefits. These beneficial chemicals include beta-carotene, which gives orange vegetables their color; chlorophyll and lutein, found in green vegetables; and anthocyanins, which give red and purple vegetables, including some types of cabbage, their color. Beta-carotene and lutein help keep your eyes healthy, anthocyanins act as antioxidants to limit damage to your cells and chlorophyll provides vitamin K.